For both moral reasons and economic reasons, we should have small government. But even a curmudgeonly libertarian like me also thinks it’s important to have effective and efficient government. Fortunately, there’s no contradiction between these views. Indeed, academic researchers have found that nations with smaller government also have more efficient government. With Singapore being a very powerful example. This is why I periodically share data looking at how much governments spend compared to how much they deliver. Though this can be a depressing exercise because – to cite one example – no government in the world spends more on education than the United States, yet we get very sub-par results. But what if we compare cities inside the United States on this basis? Are there big differences in how much some local governments spend and the results they get? The answer is yes, emphatically so. Here are some excerpts from an article in The Atlantic on which local governments do reasonably well – and very poorly – in terms of education outcomes on a per-dollar-spent basis. …education spending isn’t inherently bad—what matters is the result. Some school districts get lots in return for the amount of money they spend. …the online financial resource WalletHub has crunched the numbers on school spending at 90 of the most-populated cities across the country, revealing which ones are getting the most—and least—bang for their buck. 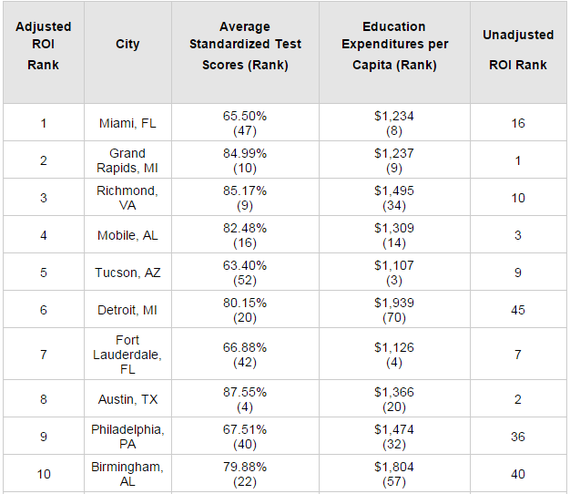 To arrive at the findings, WalletHub divided each city’s aggregate test scores in fourth- and eighth-grade reading and math by its total per-capita education spending. The researchers then adjusted those figures for various socioeconomic factors, such as the poverty rate and percentage of households that don’t speak English as their first language. 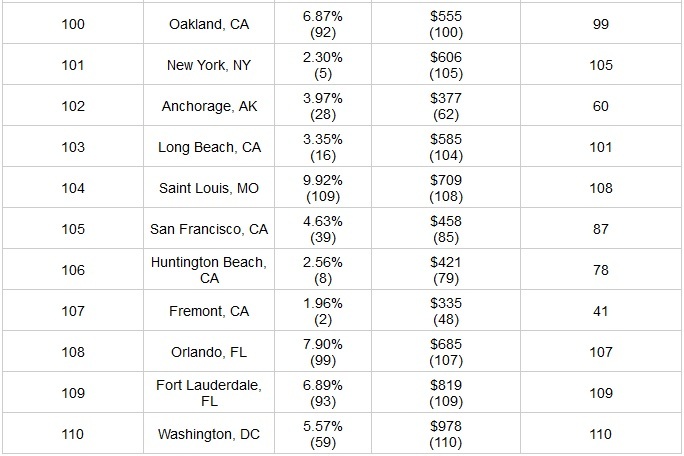 Here are the 10 cities that purportedly do the best job on a per-dollar-spent basis. And here are the cities that do the worst job. 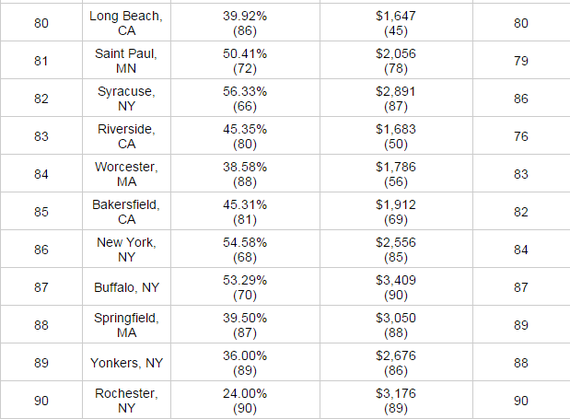 I guess I’m not overly surprised that cities in California and New York generally rank at the bottom. Though I wonder whether the results would look significantly different if education spending was measured on a per-pupil basis. That would seem a relevant distinction. But here’s the key takeaway. Some cities spend two to three times as much per capita on education, yet they actually deliver worse outcomes! Something all of us should remember next time some politician, whether Obama or some local hack, whines about the “need” for more money for schools. Now let’s look at how wisely – or ineptly – local governments spend money on crime prevention. Here’s some of WalletHub’s analysis. With tax season approaching, WalletHub assessed how efficiently the 110 most populated U.S. cities spend taxpayer dollars on police protection. We did so by calculating each city’s ROI on police spending based on crime rates and per-capita expenditures on police forces after normalizing the data by poverty rate, unemployment rate and median household income. …note that “Adjusted ROI Rank” reflects the results of our analysis after controlling for the three economic factors, whereas “Unadjusted ROI Rank” reflects the results before normalizing the data by the same factors. So which cities get decent bang for the buck? 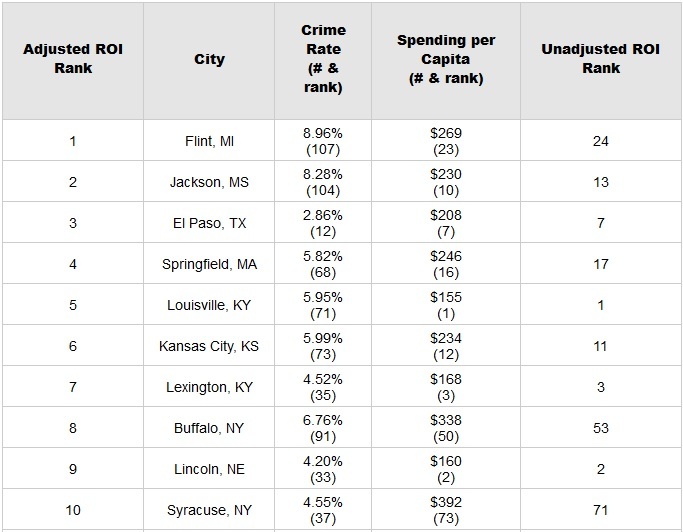 And here are the 10 cities that get the least value compared to resources devoted to crime prevention. Gee, what a surprise to see New York City (once again) at the bottom of the list. And I can only imagine how the city will rank after a few years of Bill de Blasio. And what’s the story with Long Beach, CA?!? Why are they among the worst on both lists? Anyhow, kudos to WalletHub for producing both these comparisons. This is good factual data that enables people to see whether their city is being competent or wasteful. Specifically, why are taxpayers in places such as St. Louis and Orlando spending three or four times as much, on a per-capita basis, as taxpayers in cities such as Lincoln and Louisville? The Toronto District School board encourages corruption and incompetent teachers who allow Principals to cover up unprofessional incidents. School choice, rather than our K-12 politician-controlled monopoly, will improve quality and lower costs. Unchanged education and crime levels is perhaps the “seen” effect. The unseen is the lost vitality these funds were earned with by the general population and expropriated by the government/majority. Funds that cannot be put into more fruitful use in the hands of individuals. But if you scratch below the surface (or stop listening to NPR) it easy to see this “unseen” effect at the macro level. It is quite visible in the fact that aggregate US growth trendline cannot match the world average – while Singapore can — hence the US continues to lose ground to the rest of the emerging world. Unable to stand the sight of the mansion in his neighborhood (the seen), the American voter lemming is voting himself into the worldwide prosperity average (the unseen to which the American electorate is oblivious). His only consolation: His cousins across the Atlantic — been further down the gospel of coercive collectivism — also known as the Book or HopNChange — are declining even faster. So let’s rush to the TV and enjoy some schadenfreude as our leader says that we are not declining quite as fast as Europe.